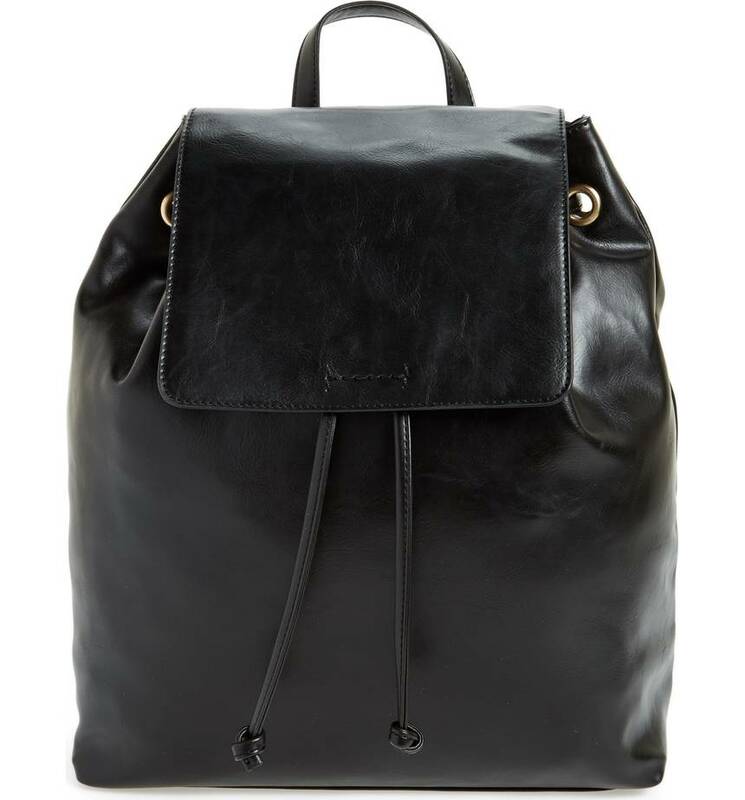 I love the look of a backpack—so urban-chic and no-nonsense. Plus, they are so much kinder to your back than carrying your life around in a handbag. I am thinking about getting one for travel, because I hate dragging a huge tote around the airport, and like the idea of being hands-free. 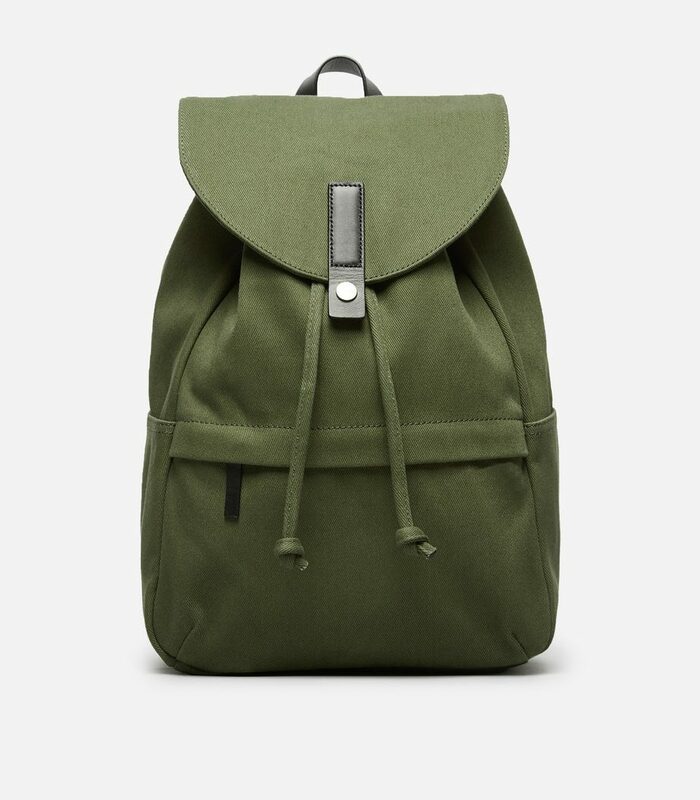 The dark green on this option from Everlane is really good, but it comes in a couple of other colors too. 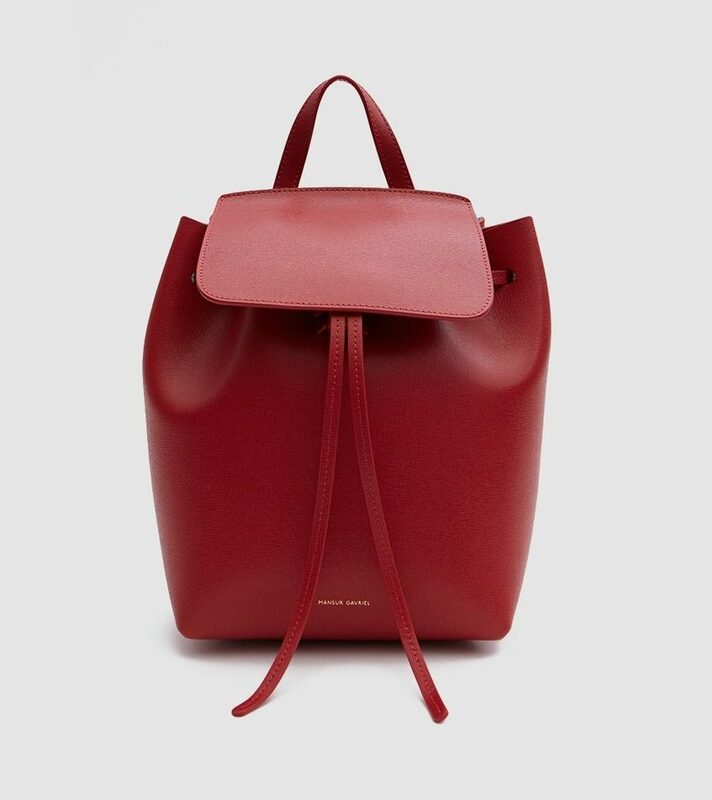 A poppy red choice from Mansur Gavriel. 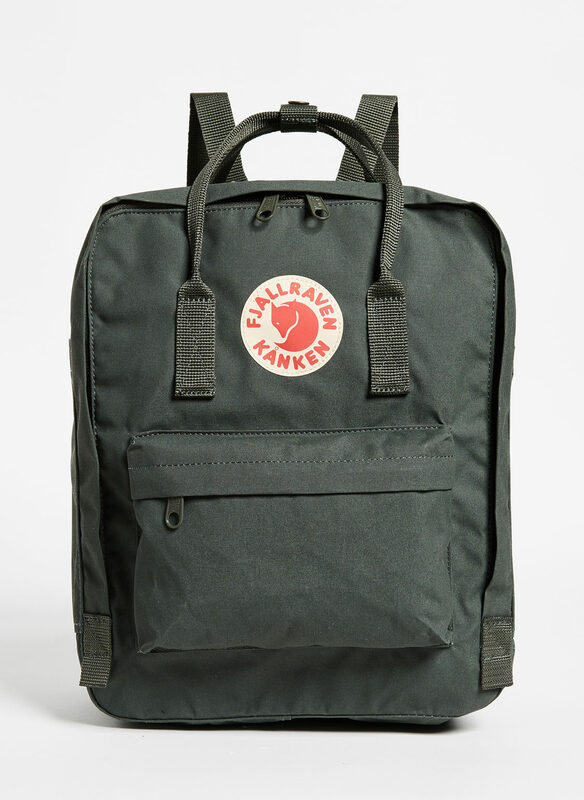 I love classic Fjallraven backpacks: they’re cheap and stylish and there’s something kind of Euro about them (they’re from Sweden, so that follows). I also like this one, which is meant for laptops. Another Fjallraven model worth considering. 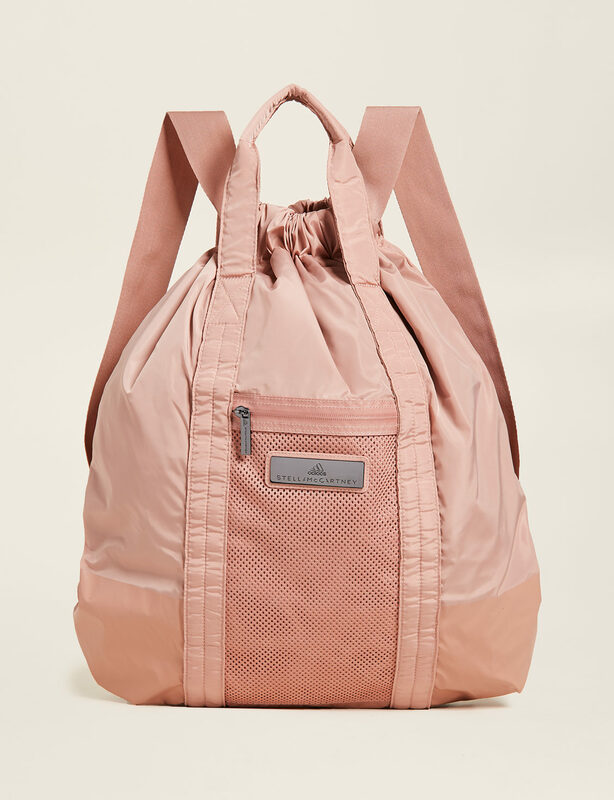 A simple, straightforward backpack from Clare V.
Kara’s backpack is a favorite of mine: so streamlined, with an oversize zipper that makes a big statement. The natural leather here will age really well. 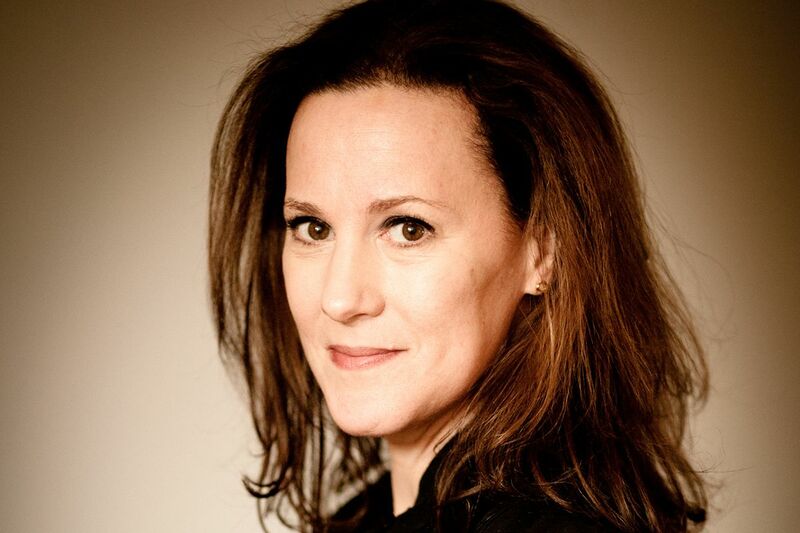 An understatedly elegant choice from Rag & Bone. 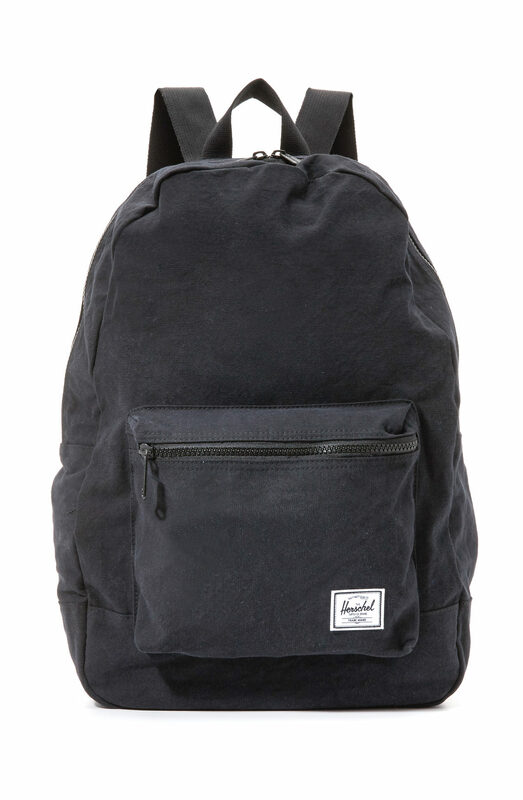 Just your basic black backpack, from Herschel. This is faux leather and a great deal. 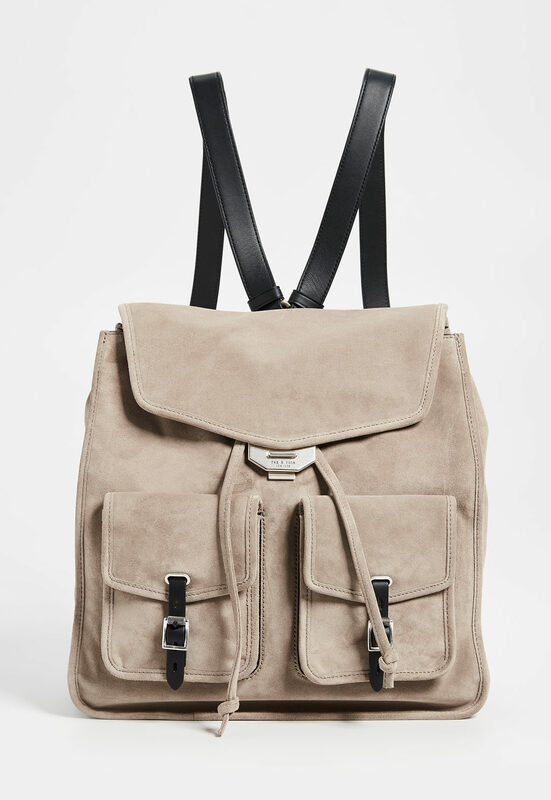 I didn’t used to like it when backpacks were shaped like something other than backpacks, but now I can see the utility of having a backpack that reads like a handbag, and for that reason I like this one from Allsaints. This is actually a gym bag, and it’s nicely big, so I’m thinking it would be great for travel. A cute little canvas number with touches of leather. This could easily go from work to evening. 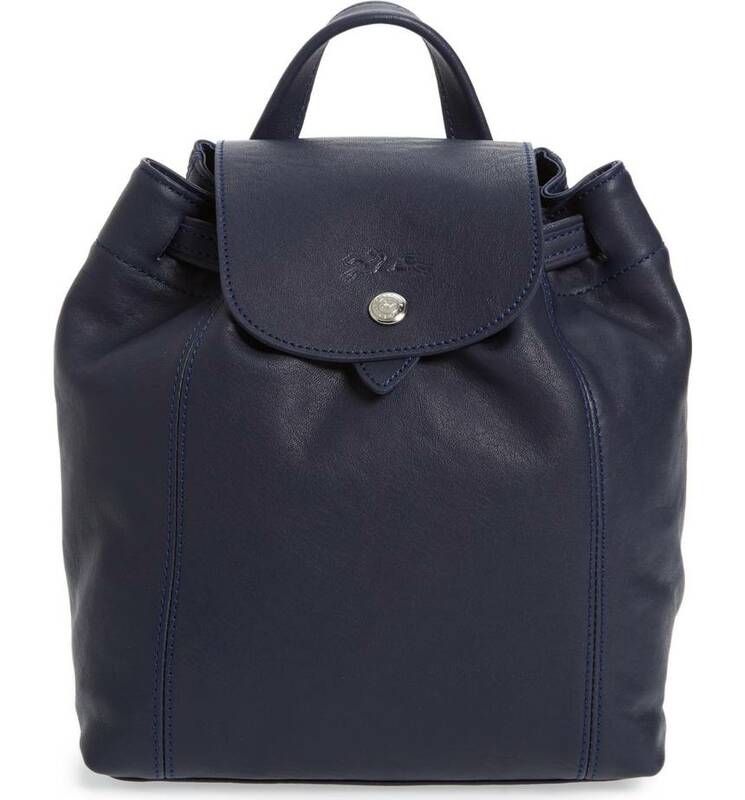 You know how geeked out I am lately on Longchamp bags, so I am loving this. It comes in black and a couple of other colors too, but I think the blue is kind of fun and less-expected. I’m not typically the biggest fan of hardware, but I really like it here. This looks a bit like what the woman in the top picture is carrying. 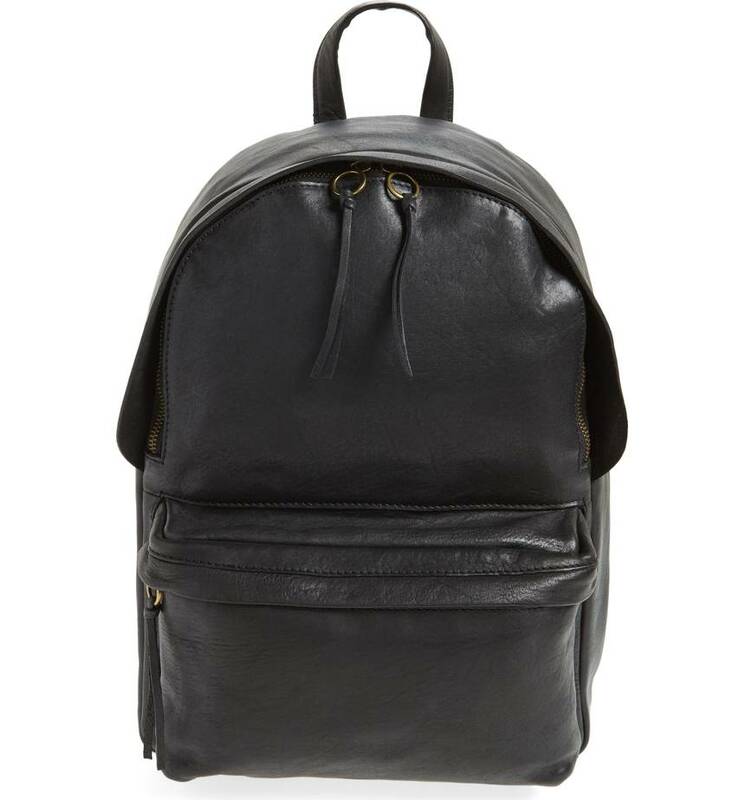 A leather backpack that’s pretty reasonably priced. And finally: something gorgeous, spendy, and French from Jerome Dreyfuss. 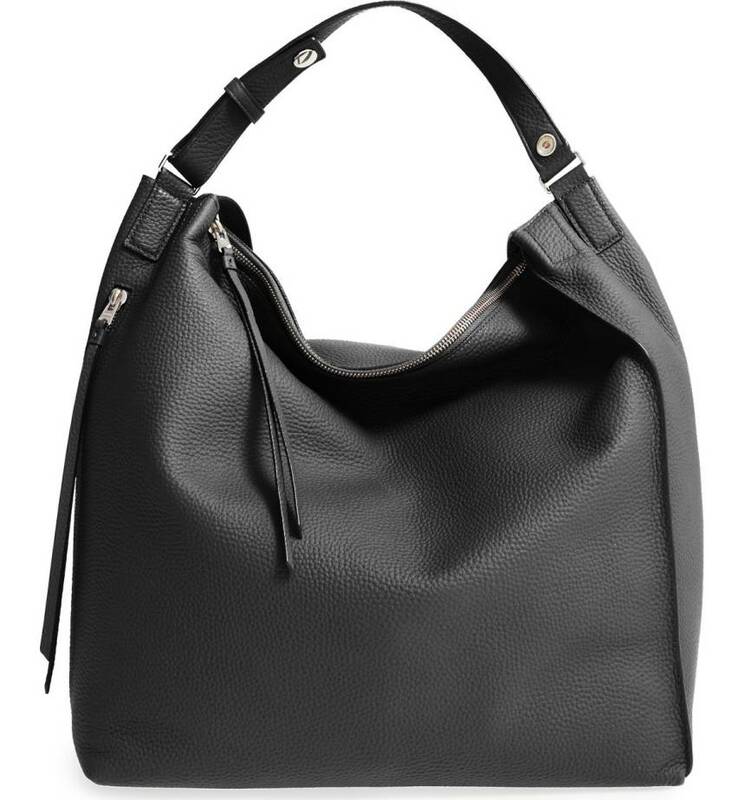 Did you miss my post on excellent everyday handbags? I resisted backpacks for the longest time – but I recently fell for a blue one from Freitag. I don’t think I can ever go back to a shoulder bag -no more weird back pain. 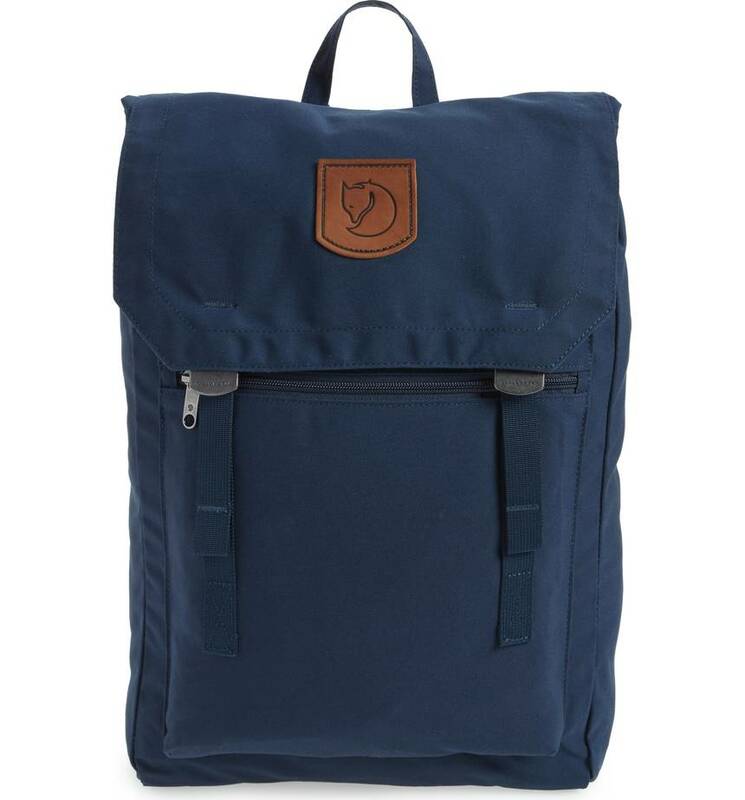 I resisted backpacks for the longest time - but I recently fell for a blue one from Freitag. I don't think I can ever go back to a shoulder bag -no more weird back pain. A plea to Kim for a future post — you know what I am always looking for, and can never find is a sling bag. By that I mean a sort of one-strap backpack not unlike the healthy back bags, but better looking. Frye used to have one (they may still do), but they aren’t common. 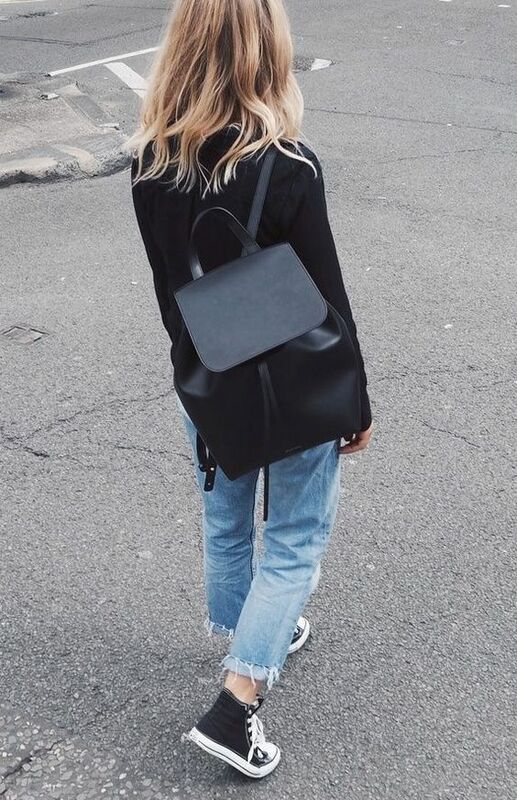 The woman is definitely carrying a Mansur Gavriel backpack, no? 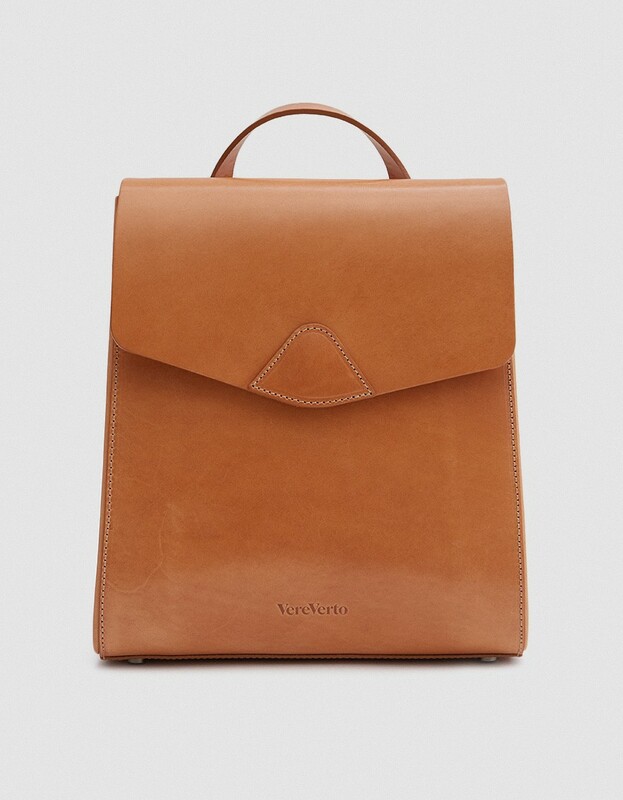 Everlane also has quite a beautiful leather backpack that’s part of their Petra collection. I quite like the way backpacks look when they’re slung over just one shoulder but that’s bad for your back too. On the other hand I feel like I look like an overgrown school girl when I wear them on both straps, especially since you have to wear them quite high to lessened the stress on your back. Apart from that, I’m super paranoid about someone stealing from it without me knowing. The woman is definitely carrying a Mansur Gavriel backpack, no? 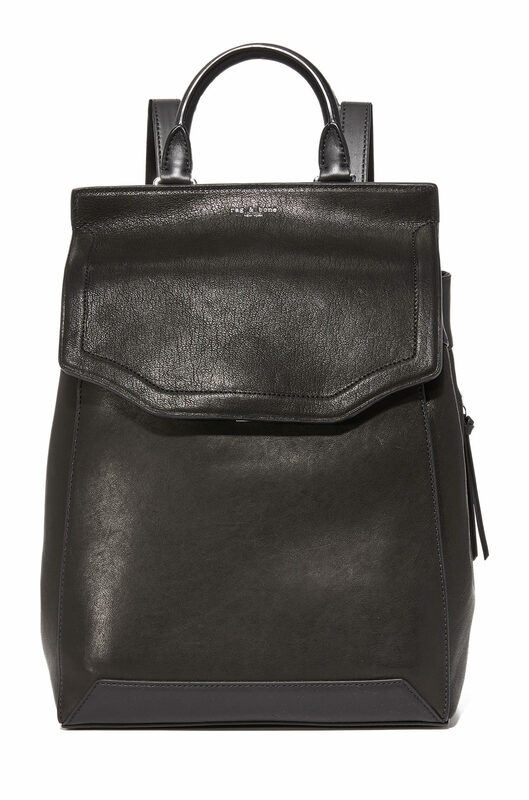 Everlane also has quite a beautiful leather backpack that’s part of their Petra collection. I quite like the way backpacks look when they’re slung over just one shoulder but that’s bad for your back too. On the other hand I feel like I look like an overgrown school girl when I wear them on both straps, especially since you have to wear them quite high to lessened the stress on your back. Apart from that, I’m super paranoid about someone stealing from it without me knowing. Exactly my fear, I always am anxious when my wallet and phone, etc are behind my back, not matter how well secured. I just feel better if I can see it. Hi Kim, just wondering how you are doing? I hope you are feeling better! I used to have the cutest little vinyl backpack. It was a frame style and the frame eventually broke. I still have it – can’t decide if I should fix it. Since it was small it never got that heavy and I used to wear it on the side in front anyway. But I totally get the back pain concerns. Hi Kim, just wondering how you are doing? I hope you are feeling better! I used to have the cutest little vinyl backpack. It was a frame style and the frame eventually broke. I still have it - can’t decide if I should fix it. Since it was small it never got that heavy and I used to wear it on the side in front anyway. But I totally get the back pain concerns. I resisted for years, but recently bought a handmade leather backpack and it’s perfect for when I need more than my tiny cross-body. I’m not convinced I don’t look like a dork in it (the bag itself is perfection, but on me? Jury’s still out), but i won’t go back to the shoulder and back pain i denied for so long. I resisted for years, but recently bought a handmade leather backpack and it's perfect for when I need more than my tiny cross-body. I'm not convinced I don't look like a dork in it (the bag itself is perfection, but on me? Jury's still out), but i won't go back to the shoulder and back pain i denied for so long. When visiting my physiatrist, she moved my shoulder bag (to make room in the exam room) and told me it was one of the causes of my shoulder pain. I proceeded to purchase this backpack and had a custom laptop cushion pocket added. Love it. I have three boys and managed to avoid anything resembling a backpack. But that being said, I’ll use one of their school backpacks (Jansport) when we go to Disneyland or something. Less than $40 and they can sure take a beating! Tell me…what did you end up buying at the ShopBop sale? I have three boys and managed to avoid anything resembling a backpack. But that being said, I'll use one of their school backpacks (Jansport) when we go to Disneyland or something. Less than $40 and they can sure take a beating! Tell me...what did you end up buying at the ShopBop sale? For normal work days when I’m going into the office, I stick with my traditional tote bag. But weekends and work from home days — I’m ALL about my backpack. I mean I spend all this time going to yoga and Pilates, only to heave my giant, heavy bag over my shoulder? It makes no sense! My backpack is Adidas / Stella McCarthy, this cool type of material that looks grey until you’re in the sun and then wahbam! It’s silver. It was a little difficult figuring out to wear it with, athleisure obviously makes the most sense, but after a visit to sf (where it feels like everyone wears backpacks) I was ready to incorporate it into my non-workout casual wardrobe. I would add that my backpack, unlike the ones highlighted, is a running backpack which means it fits high, snug and tight. It’s large enough to fit my iPad and laptop in, but just barely. I like that size though because it’s barely perceptible and doesn’t bounce around. For normal work days when I'm going into the office, I stick with my traditional tote bag. But weekends and work from home days -- I'm ALL about my backpack. I mean I spend all this time going to yoga and Pilates, only to heave my giant, heavy bag over my shoulder? It makes no sense! My backpack is Adidas / Stella McCarthy, this cool type of material that looks grey until you're in the sun and then wahbam! It's silver. It was a little difficult figuring out to wear it with, athleisure obviously makes the most sense, but after a visit to sf (where it feels like everyone wears backpacks) I was ready to incorporate it into my non-workout casual wardrobe. I would add that my backpack, unlike the ones highlighted, is a running backpack which means it fits high, snug and tight. It's large enough to fit my iPad and laptop in, but just barely. I like that size though because it's barely perceptible and doesn't bounce around. I work at a university and look like I’m 12 so no Herschel or Fjallraven for me (literally every student on campus has one or the other). Some of my favourite “adult” backpacks I have are a leather Beara Beara one I bought years ago in London that still looks great — highly recommended. 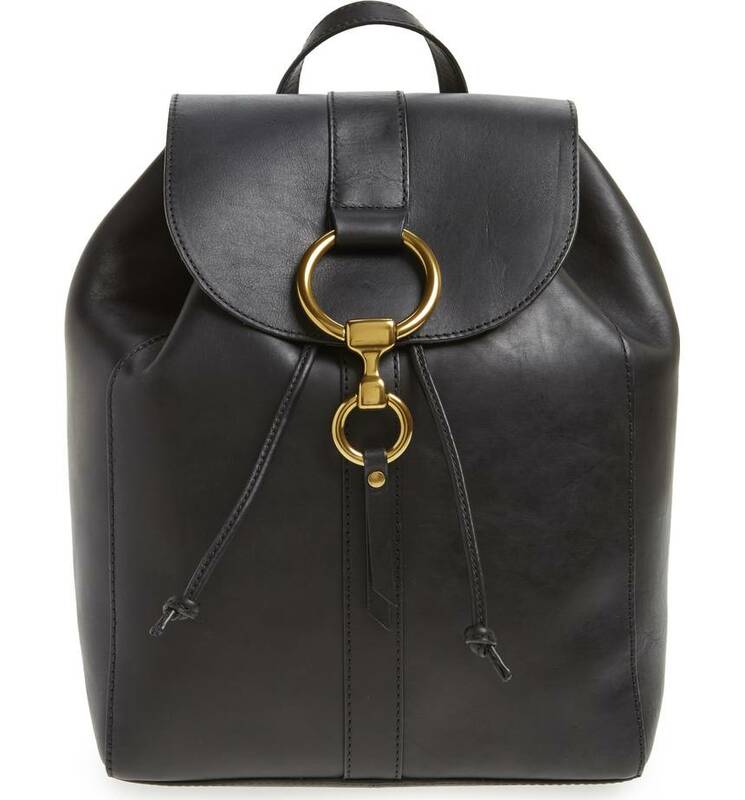 Also can’t go wrong with the classic mini leather Coach backpack, which I use when going out after work. And my trusty black randoseru (Japanese school bag) that came with me while travelling for a year. Its hard case is perfect for carry-on and it fits way more than you’d expect! I work at a university and look like I'm 12 so no Herschel or Fjallraven for me (literally every student on campus has one or the other). Some of my favourite "adult" backpacks I have are a leather Beara Beara one I bought years ago in London that still looks great -- highly recommended. 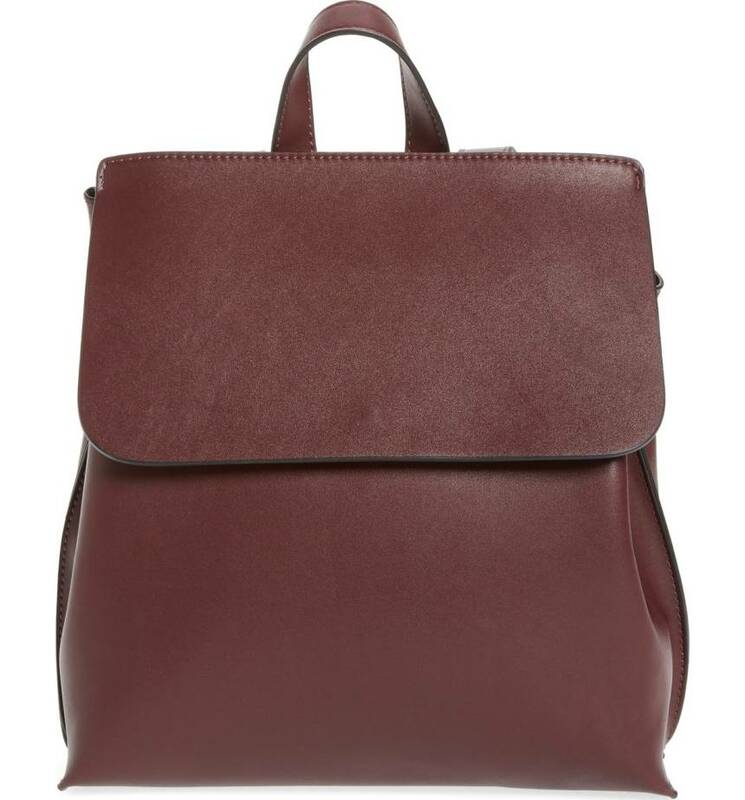 Also can't go wrong with the classic mini leather Coach backpack, which I use when going out after work. And my trusty black randoseru (Japanese school bag) that came with me while travelling for a year. Its hard case is perfect for carry-on and it fits way more than you'd expect! After too many work trips carrying either a nylon Oigo backpack that I swiped from my husband or an overstuffed tote bag with straps that felt like they were going to give every time I picked it up, I decided I needed a grown up work bag and had been trying to figure out what to get. 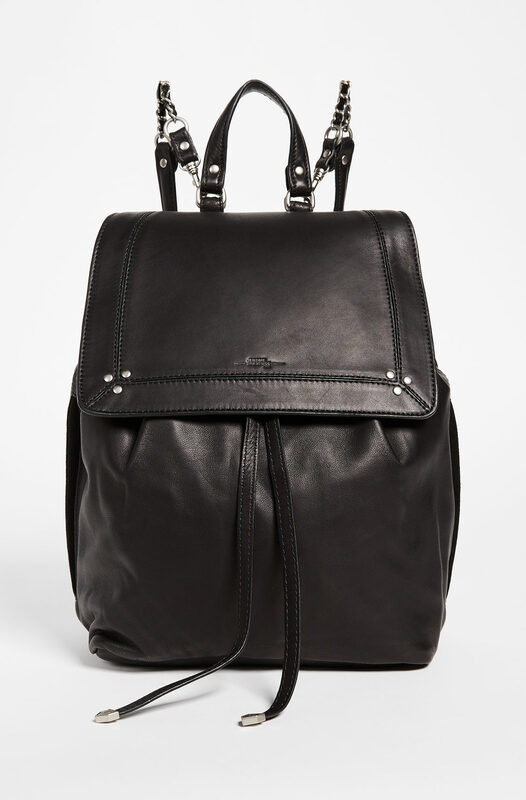 Wandering around Amsterdam one rainy Saturday after a long couple of weeks at a client, I spotted a very chic lady carrying this sleek Doc Marten backpack – https://tinyurl.com/y9cpmbmz – which led me straight to the store to buy one for myself – seemed perfect, backpack, but with a top handle for when you didn’t need to be hands-free, not too big so it couldn’t get too heavy, nice outside pocket for phone, small stuff. After discovering that the size that my laptop and other required papers, etc. was out of stock in both stores, I figured that I would spend some time on the internet when I got home. I wandered out of the store in the Jordaan and ended up in the Hester van Eeghen store where I promptly fell in love with and bought a large Super Duper bag – https://tinyurl.com/y8f6cfgf – in red with black and charcoal grey straps. It is by far the most expensive impulse purchase I have ever made (except for my house, but that is another store for another post comment) but I have not regretted it for a single minute. With absolutely no changes to the straps it can be a shoulder bag, a backpack, or a hand bag; has four interior pockets so I can keep my laptop and papers separate from my cords and other miscellany; there is a zipper pocket in between the two main pockets that is perfect for my iPad; and an exterior zip pocket on the side of the bag that sits against my back where I can keep my passport and other things I need quick access to when traveling. Extra bonus points for having something unique in a sea of sameness. After too many work trips carrying either a nylon Oigo backpack that I swiped from my husband or an overstuffed tote bag with straps that felt like they were going to give every time I picked it up, I decided I needed a grown up work bag and had been trying to figure out what to get. Wandering around Amsterdam one rainy Saturday after a long couple of weeks at a client, I spotted a very chic lady carrying this sleek Doc Marten backpack - https://tinyurl.com/y9cpmbmz - which led me straight to the store to buy one for myself – seemed perfect, backpack, but with a top handle for when you didn’t need to be hands-free, not too big so it couldn’t get too heavy, nice outside pocket for phone, small stuff. After discovering that the size that my laptop and other required papers, etc. was out of stock in both stores, I figured that I would spend some time on the internet when I got home. I wandered out of the store in the Jordaan and ended up in the Hester van Eeghen store where I promptly fell in love with and bought a large Super Duper bag - https://tinyurl.com/y8f6cfgf - in red with black and charcoal grey straps. It is by far the most expensive impulse purchase I have ever made (except for my house, but that is another store for another post comment) but I have not regretted it for a single minute. With absolutely no changes to the straps it can be a shoulder bag, a backpack, or a hand bag; has four interior pockets so I can keep my laptop and papers separate from my cords and other miscellany; there is a zipper pocket in between the two main pockets that is perfect for my iPad; and an exterior zip pocket on the side of the bag that sits against my back where I can keep my passport and other things I need quick access to when traveling. Extra bonus points for having something unique in a sea of sameness. I love MZ Wallace’s backpacks. Not sure if they weren’t included because of their price? I’m a backpack wearer. The key is an easy open top. No buckles, foldovers etc., cute as they are. I still carry my Duluth Pack with buckles, because it’s cool and I have it, but as of now I’m eyeing the Kara zipper version. I see from their website that it does hold a 13 in ch laptop. Thank you. I'm a backpack wearer. The key is an easy open top. No buckles, foldovers etc., cute as they are. I still carry my Duluth Pack with buckles, because it's cool and I have it, but as of now I'm eyeing the Kara zipper version. I see from their website that it does hold a 13 in ch laptop. Thank you. Kim, I just noticed that Matt and Nat’s even has camo. Kim, I just noticed that Matt and Nat's even has camo. 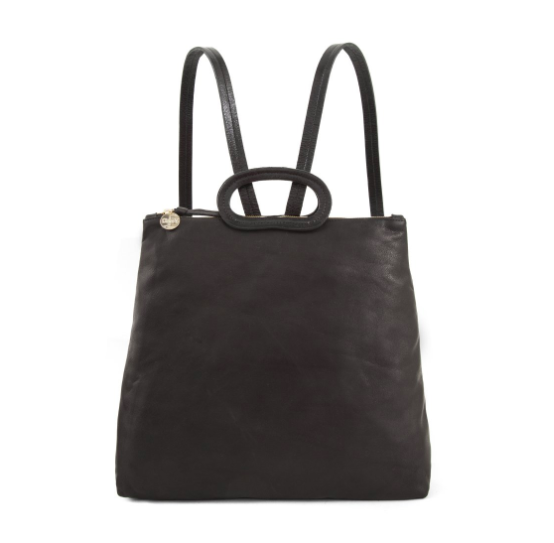 I have the Everlane backpack black canvas – it suits for my laptop and is a nice size. However, it is a lint magnet. Id go with their leather option as someone mentioned above. 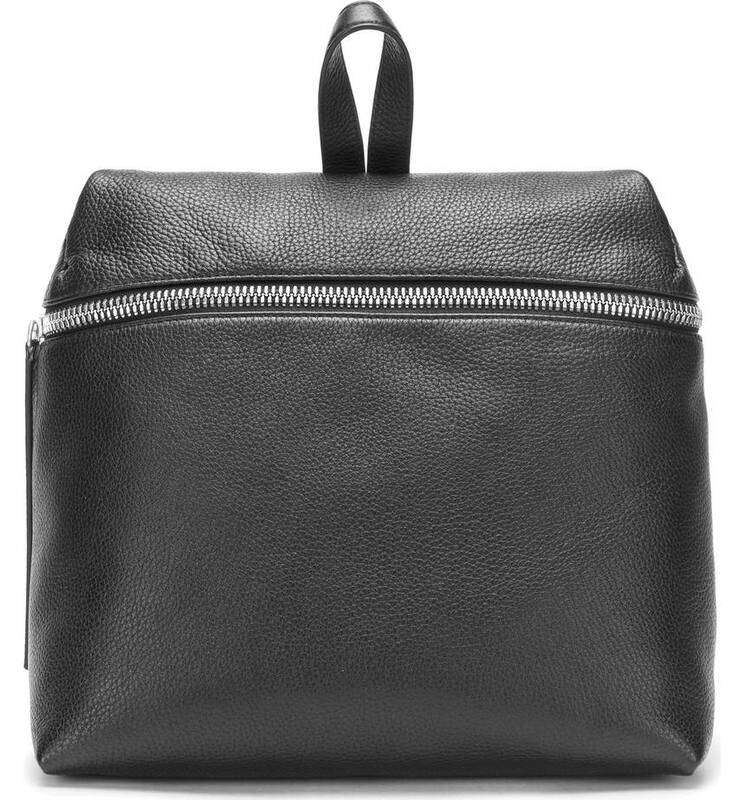 I have the Everlane backpack black canvas - it suits for my laptop and is a nice size. However, it is a lint magnet. Id go with their leather option as someone mentioned above. I’ve used a Fjallraven backpack for years now and recently upgraded to the laptop version. So worth it. Best for everyday and Overseas work trips. Laptops are not easy to drag around. I've used a Fjallraven backpack for years now and recently upgraded to the laptop version. So worth it. Best for everyday and Overseas work trips. Laptops are not easy to drag around. 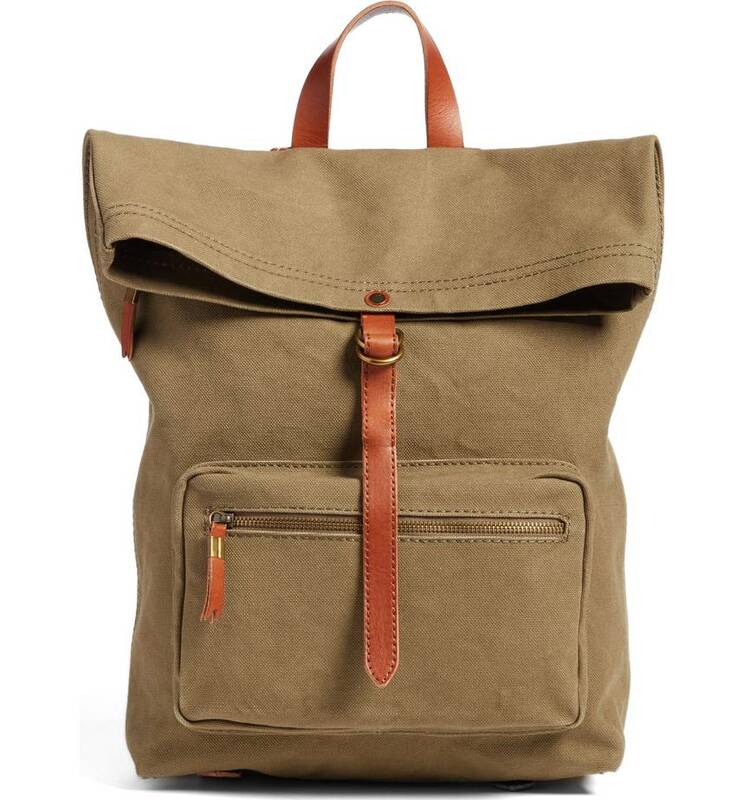 Anello backpacks from Japan are all the rage in Singapore right now. I got one after being ordered to stop carrying a shoulder bag by my doctor (crazy neck strain headaches). I had a Herschel back pack and the opening was so small that I could barely get my laptop or anything else out of it. Horrible design. The Anello has a snake jaw sipper opening and I love it – the only downside is no laptop pocket. They come in amazing color choices though and have great padded straps. Anello backpacks from Japan are all the rage in Singapore right now. I got one after being ordered to stop carrying a shoulder bag by my doctor (crazy neck strain headaches). I had a Herschel back pack and the opening was so small that I could barely get my laptop or anything else out of it. Horrible design. The Anello has a snake jaw sipper opening and I love it - the only downside is no laptop pocket. They come in amazing color choices though and have great padded straps. As a bus commuter I finally broke down and got a backpack to replace my oversized handbag I had been using. I love it and will never go back, my back and hips are so much happier and it’s so much easier not having to shift the bag from arm to arm to use my hands. It took a while to receive since it had to go through customs after being shipped from South Korea, but it was so worth it. 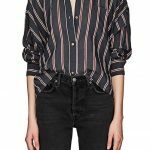 They have other cute styles too, including one that resembles the Madewell one here. As a bus commuter I finally broke down and got a backpack to replace my oversized handbag I had been using. I love it and will never go back, my back and hips are so much happier and it's so much easier not having to shift the bag from arm to arm to use my hands. I bought this one, which is grownup and really nice looking while still being big enough to be useful, also very reasonably priced: https://www.etsy.com/listing/262824620/tweed-square-backpack-grey?ref=shop_home_active_1 It took a while to receive since it had to go through customs after being shipped from South Korea, but it was so worth it. 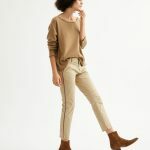 They have other cute styles too, including one that resembles the Madewell one here. Switched to a backpack about 15 years ago after realising that my cool Club Monaco one-shoulder briefcase was killing me. I have a black (with white polka dots!) Herschel backpack. 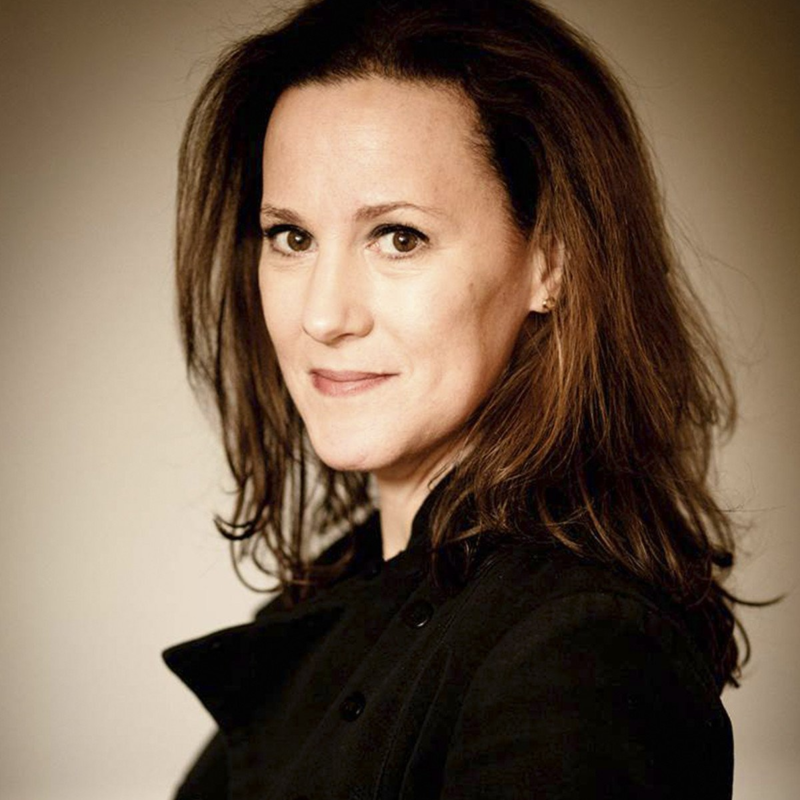 I am sure that I would look more polished with a briefcase, but my shoulders are grateful!